Without a doubt that Reaper opening into 1-1-1 is the most popular build in TvZ right now, and I think it is arguably the best ladder build because it has a solid set up for anything. I will list some of the common variations. First of all, it is debatable to whether call the different variants different builds, because the build order set up is the same. You basically have the flexibility to get any unit by changing the add-ons once you have the core structures. Subsequently, every build plays out the same, as you converge to the next convergent point as shown in the image below. In case, you don’t know what I mean by convergent point, you can read it up here (part 1 and part 2). What you add after the convergent point 2 depends on what composition you want, but I will stop at the 5-1-1 convergent point with three bases assuming you are going for a macro game for the purpose of discussion. Although I show the build order with a specific type of Reaper expand, you can do the same thing with other openings by making minor adjustments based on the building block logic. The main focus of this post is about the variations after you have reached convergent point 1. Also, you can add the buildings in different order, for example you can get either the third Command Centre first or the second and third Barracks first (e.g., Maru vs. Losira game below). This is all down to convergent point and game plan. The one Marine after Reaper variation has been the default Reaper opening now for TvZ and TvT. The early Marine can help to help against Overlord scout in base or you can even use it to move out to hunt Overlord if you are confident with it. 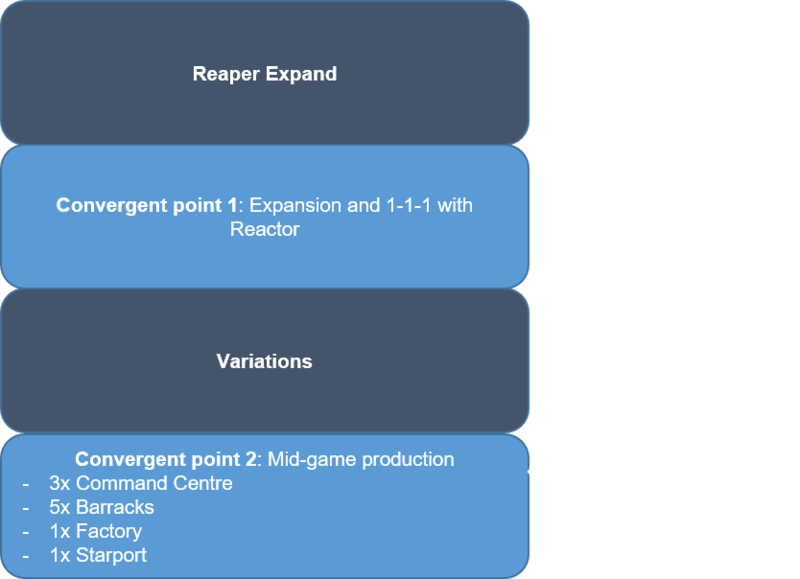 Although you can get a Reactor immediately after the Reaper and make two Marines instead of one, the benefit of having one Marine a production cycle earlier outweighs the benefit of having two Marines later at that stage. Another key is the second Refinery, which is required for most 1-1-1 variants. The timing is usually at 23 or 24 supply, and I think the difference is negligible. Perhaps it is easier to remember the opening by simply getting the second Refinery when you put down the Factory. You have reached convergent point 1 when the Starport starts to build. There is a reason why I say “starts to build” instead of “complete”. There are two main variations and several sub-variations from this point, and the decision to choose which of the two main variations you want to go for happens right after you start the Starport. The first and the most common one is to swap the Factory onto the Reactor and make Hellions. I have been discussing whether Reactor Hellion will remain the important convergent point in TvZ in Legacy of the Void, and it appears that it still is. The standard number of Hellions is four (two pairs from Reactor). They still serve the same main purpose since Wings of Liberty, and it is for map control and scouting. Reactor Hellion and Tech Lab on Barracks follow up is the most common variation. This can then branch out to several sub-variations. You can swap the Tech Lab onto the Starport for Cloaked Banshee. Then, put down another Tech Lab using the Barracks for Stim. Alternatively, you can start Stim right away with the Tech Lab on the Barracks, and produce a Medivac. The Medivac is mainly for Hellion drop, which is effective in pinning opponent in base. If Zerg is going for Roach and Ravager attack, you will know based on the information gathered from this drop. After the Medivac, you can choose to produce either a Viking or a Liberator. The Viking is obviously used to hunt Overlord, and the Liberator can be used for harassment. Of course, you can mix it up by producing a pair of Widow Mine instead of a second pair of Hellion. The goal is still the same, you should drop attack. The 4:00 Roach and Ravager attack in the vod below didn’t allow the drop to proceed, but you can still tell what ByuN is trying to do. Just to be more comprehensive, Terran often favor a Liberator over a Medivac when Legacy of the Void was just released. You can hardly find a recent vod that goes 1-1-1 with Tech Lab on Barracks for Stim then get a Liberator first. When you produce Reactor Hellion, you always have the option of a Hellbat attack. The general idea of Reactor Hellion into Hellbat attack has not changed since Heart of the Swarm. You mainly mix in a Starport offensive unit, which can be Banshee, Liberator or Medivac (with Marines). It is considered an inferior build now, because Zerg generally do not have problem holding it. This is something new in Legacy of the Void. After the Factory has been swapped on the Reactor, you make another Reactor with the Barracks. The second Reactor is for the Starport. Subsequently, the Barracks puts down a Tech Lab for Stim. The main variation is to get two Liberators out for harassment. I have previously discussed a specific double Medviac drop follow up. Recently, I have seen a non-Liberator variation with a Reactor on Barracks, and it gets a Medivac and a Viking at the same time. It seems rather unorthodox at the first glance, but it is essentially just shuffling the resource. The Medivac is for a drop (you can mix it around with Hellion or/and Widow Mine), and the viking is to hunt Overlord. You can say that it is the same as the Hellion drop variation I mentioned above, but this basically delays the Stim upgrade for a Viking. This is the second major variation. You don’t swap the Factory onto the Reactor, and just keep making Marines. There are three reasons to not swap the Reactor and go for the relatively standard variation above. It is not a bad choice to begin with, so you choose to mix it up by not swapping the Reactor. I have previously discussed about using this as a metagame reaction against Roach and Ravager all-in. However, there are other ways to play the build out without getting an early Tank. For example, you can go for a Widow Mine drop, and follow it up with other harassment options like Liberator or Tank drop. If you have scouted that opponent is going for a very early attack like Spawning Pool before Hatchery, you may want to keep making Marines and get a Tank quickly. In the vod below, ByuN scouted the late Hatchery at the natural, and decided to get a Widow Mine like what he did in the above vods. I think he is expecting Zerglings at first. But he immediately cancel the Widow Mine and get a Tech Lab for Tank after he saw the Roaches. Therefore, if you scouted the Roach Warren early while the Factory is still building, you can put down the Tech Lab once the Factory is done for the quickest Tank possible. This variation is also a good choice on a short rush distance map like Ulrena. Reactor Hellion can be vulnerable against early Roach and Ravager. INnoVation has shown that in a recent game against Leenock by going straight into Tank for a Tank drop harassment and scout. His quick follow up with Marine, Tank and Medivac on the map was deadly. The discussion is focused on the opening and the subsequent variation of 1-1-1. The basic set up can be used on any map against any Zerg, and I doubt it will ever get left behind in the metagame. You can change your subsequent variation according to preference, metagame and map. Recently, INnoVation has brought back the classic early three Command Centre from the Heart of the Swarm days, and it is different to the basic 1-1-1 set up of this post. I will discuss that in another post. I’m a fan of going viking/liberator to hunt overlords, because nydus rushes are very hard to stop otherwise. That’s a decent precaution, but it is still pretty hard to stop one from coming in if that’s the zerg’s planned build. Nice paper again Max’ ! Im reading it in diagonal, but I’ll got more time I’ll surely finish it. I wanted to talk about the 2 base push Maru did vs Losira, that’s something realy good vs Speeling and Banelings type of play. But I assume that Maru wouldnt go for this +1 atk only Marines vs Roach and Ravagers. I don’t know if you guys remember when Hots first come out and we got MVP (vs stephano) doing a big push on 2 base with Hellbat ( Can we say that’s an all in ? ) mixed with Marines, Marauders and only stim ( no Starport, no Ebay ). I’m actually trying to do a “refont” of this build on my low master ladder, make it work pretty well vs RoachRavagers but I’m still not confident about this one, and I don’t know if this a build you can do to counter RR plays from zergs. What Maru did against Losira is more of having two Barracks instead of a third Command Centre. It is more of a shuffling of the building sequence for the next convergent point. If you want to do a push with bio and Hellbat, you may want to examine Polt’s recent games in WCS. He mixed it up pretty well.